​Dr. Banks has over 20 years of social work experience. She started as a generalist practitioner in the areas of substance abuse, mental health, health, family visitation and placement. She was the first Child Welfare Services/Case Management Systems (CWS/CMS) Trainer in San Francisco County Human Services. Her exposure and experience in training was the beginning of a long love aﬀair with teaching and learning. 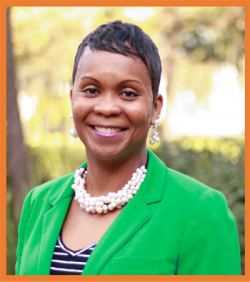 Dr. Banks has held several academic (& academic inspired) posi-tions which included Lecturer; Adjunct Faculty; statewide coordinator of curriculum development and educational standards; and international conference coordinator. Her research interests include workforce development, role performance affirmation among African American couples, evaluation of international programming and movement (dance) as self-care and healing techniques. I bring greetings to our students, faculty, staff, field instructors, task supervisors, Community Advisory Board, Central Valley Unit—NASW and anyone else who plays a large and/or small role in helping to teach, mentor and coach our students as they prepare to become professional social workers. I am elated to share my vison for Field Education. I consider myself a dreamer and idealist grounded in pragmatism. This means that I remain ever hopeful and vigilant to change imperfect systems knowing that the reality can, may or might take Herculean efforts and a team of warriors who are willing to fight the good fight! The mission of the MSW department resonates with me so much that I believe it’s fate that joined the two of us together. My immediate goals are to familiarize myself with the operationalization of the administrative office, learn more about and continue to build on the relationship with our partners and the geographic region, reinforce the nexus between classroom education & experiential learning.